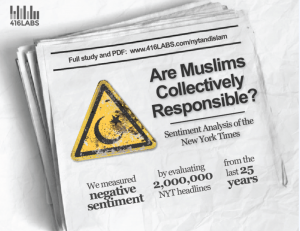 A study released in November 2015 by 416 Labs, a Toronto-based consulting firm, reveals that the New York Times portrays Islam/Muslims more negatively than alcohol, cancer, and cocaine among other benchmarked words. “57% of the headlines containing the words Islam/Muslims were scored negatively. Only 8% of the headlines were scored positively. Compared to all the other benchmarked terms (Republican, Democrat, Cancer and Yankees, Christianity and Alcohol), Islam/Muslims had the highest incidents of negative terms throughout the 25-year period. 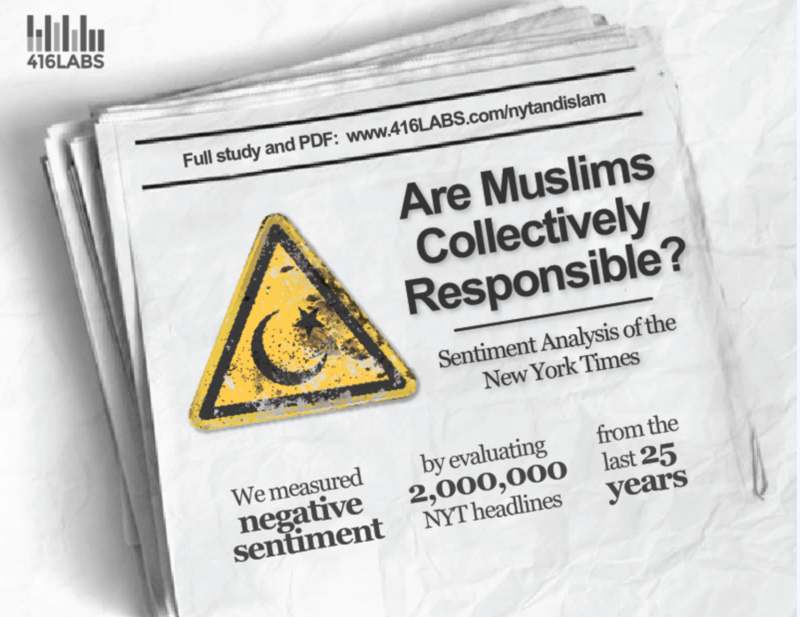 Not once over the examined period does the aggregate negative sentiment of headlines related to Islam/Muslims go below the NYT aggregate (29%) for all headlines. Spencer is yet to “demonstrate his qualifications to explicate this topic,” said Zhou. In fact, according to a report by the Muslim Public Affairs Council, Spencer, along with many other so-called “experts” on Islam, lacks crucial qualifications on the subject matter, and “mostly engages in internet-based polemics that he tries to pass off as serious scholarship.” In 2014, Carl W. Ernst, professor of Islamic Studies at the University of North Carolina – Chapel Hill, said that Spencer’s views “have no basis in scholarship,” with “no academic training in Islamic studies whatsoever.” Incidentally, UNC-CH is where Spencer earned his Master’s focusing on early Christianity. Though the study keenly recognized that its findings are not necessarily the result of intentional choices by decision makers at the Times, it clearly points to an institutional tendency by many agenda-setting newspapers and organizations to paint Islam and Muslims with a single brush: war, violence, and terror. Zhou said the study’s empirical approach “sets an example” for many other topics because “critical rhetoric and slogans can only be effective with supporting evidence and crunching the numbers.” One topic that undoubtedly serves as fertile ground is the Israeli-Palestinian conflict. 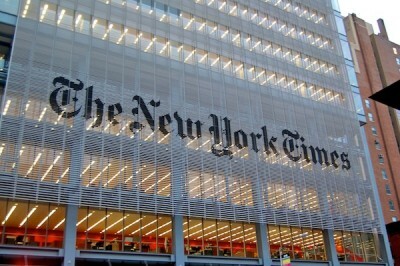 The NYT is a standout case for several reasons: at least 3 sons of NYT editors assigned to cover Israel and Palestine served, or continued to serve, in the Israeli occupation forces, evident manipulation and biased coverage, as well as a trend of accommodating official Israeli perspectives far more than Palestinians’, all of which pose a serious conflict of interest to fair and balanced coverage, inviting a similar empirical investigation. Several recommendations are offered by the authors of the study to “help represent Islam/Muslims in a more accurate way.” These include educating reporters on the nuances of Islam, engaging local Muslim voices, and greater activism by Muslim organizations among others. Zhou said the most crucial tool for these recommendations to be taken up by people is “through creating spaces for Muslims beyond the mosque and home to talk about and engage with civic life. Dorgham Abusalim recently graduated with a Master in International Affairs from the Graduate Institute of International and Development Studies, Geneva, Switzerland. You can follow him on Twitter @dabusalim.